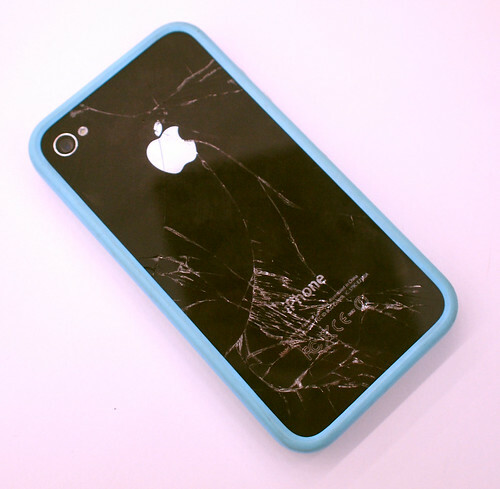 Nick Bilton who blogs for the New York Times has dropped and smashed the front of his Apple-loaned iPhone 4. Here it is a complete, fragmentary, mess. I thought it would work beautifully until I dropped my iPhone on the concrete on Tuesday evening. The phone’s glass became a Humpty Dumpty look-a-like. Musing on this mini-disaster leads Nick to consider that perhaps the requirement that electronic devices should look and feel uber-slick has led Apple’s designers to sacrifice function for form and to build objects which are insufficiently robust. Jason Brush, executive vice president of user experience design for Schematic, a branding and design agency, noted in an interview that the fragility of electronics today might not lay in the form and function debate, but rather that gadgets are not meant to be long lasting. Clearly Mr. Brush is on to something here. iPhones are not built to last the way that Leica phones are, or were. But surely Jason Brush and Nick Bilton are missing the key point with this criticism? Apple’s devices (iPhone, iPad, iPod Touch etc) are obviously not built to last, they will be improved upon very soon; more germanely they are not built to be objects in the sense in which the Leica was an object. The Leica camera is a specific functional tool with which quite specific and well-framed tasks would be performed in a professional manner. Nick Bilton has committed what philosophers like to call a ‘category mistake’. He has mistaken the iPhone for a Leica-like object when it is clearly an adverbial-appendage. The iPhone and the iPad are not truly objects, they are adverbs. They are only parenthetically about taking pictures, they are mainly about doing all kinds of stuff, much of which you hadn’t even considered to be do-able in that way, or at that remove. They are multi-purpose mediators through which the web and the internet interacts with the user. It is moot whether they are appendages to us, or appendages to the web through which stuff now happens. The creative process is now all about the web (subject) doing (verb) to us (object) in a certain way — perhaps most stylishly in the Apple way. The iPad is, by some distance, the most adverbial of the range of devices that Apple has produced. That it is a range of devices, each of them invoking their own adverbs, and hard to copy or emulate is the key Apple’s ‘defensive’ stance in relation to Android and other competitors. Any company that wants to compete with Apple now has to do some deep syntactic analysis. The adverbial genius of the iPad is that it has redefined and clarified the adverb ‘gorgeously’, ‘stunningly’, ‘veridically’ or ‘lazily’ in the way that we interact with the web. The genius of the new iPhone is that it has appropriated the adverbs ‘instantly’, ‘face time’ (which in spite of sounding like a process, is on its way to becoming an adverb characterizing conversation), ‘unintentionally’ and ‘magically’ to the previously more or less routine but increasingly mobile business of using a telephone. So, Nick Bilton really should not worry about breaking an object (especially since it is one that had been loaned to him by Apple, ‘generously’). He has lost an object but gained access to a range of adverbial devices each with unique performance envelopes through which he can interact with the web in the way that Apple envisages smart journalists now need to do that. Guiltlessly and perhaps carelessly. Hold on for the iPad nano, Nick.